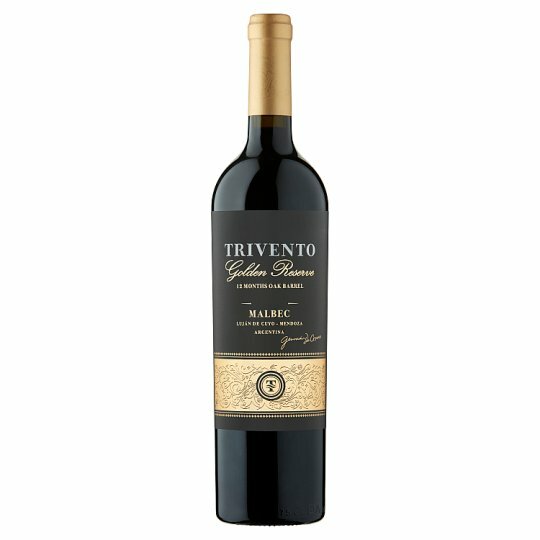 Trivento Golden Reserve Malbec is a legacy of traditions passed down from generation to generation; and expresses the passions of everyone involved in the vineyards' labours. Hand-selected grapes are then transformed into a concentrated garnet-red wine whose lively red fruit aromas and silky tannins make way for a flood of sensations on the palate. Trivento Golden Reserve Malbec is a legacy of traditions passed down from generation to generation; and expresses the passions of everyone involved in the vineyards' labours. Hand-selected grapes are then transformed into a concentrated garnet-red wine whose lively red fruit aromas and silky tannins make way for a flood of sensations on the palate. Complex, fruity and fresh. The aromatic profile expresses both sweetness and gentleness of red and black fruits, with light touches of marmalade. Deep yet subtle notes from the oak barrel ageing, with lots of personality. On the palate this Malbec is pleasant, sweet and profound, with vibrant tannins and a long and smooth finish. Food Pairings: Perfect when served with a succulent steak or a rich winter stew.